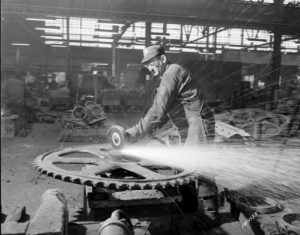 The Victorian historian’s portrait of Milwaukee as a blue-collar industrial capital, a stereotype that has endured for generations, is accurate to an extent, but it reflects only one understanding of work in a single historical period. The concept of work is both more dynamic and considerably broader than Flower suggested. Reduced to its essentials, work may be defined as any form of life-supporting activity, or, less succinctly, as the diverse means by which individuals achieve and maintain a standard of living and thereby participate in the economy of the society around them. Stated even less formally, work is what grown-ups do all day if they are not independently wealthy. For Milwaukee’s first residents, work was necessarily oriented to the resources at hand. The land itself provided Native Americans with all the materials they needed to make a living, and work, for them, involved converting those materials to food, shelter, clothing, and other necessities. Saplings, bark, roots, sap, and flowering wild plants from the area’s abundant woodlands were turned into wigwams, canoes, cradleboards, maple sugar, dyes, berries, medicine, and a host of other useful items. Local wetlands supplied the native tribes with reeds and rushes for mats and baskets, fish and waterfowl for protein, and wild rice for nutrition through the long northern winters. Fur-bearing animals were hunted not only for their meat but also for skins that became clothing and for claws, teeth, and quills that became adornments. The earth itself yielded clay for pottery, powdered soil for pigments, and siliceous stones for fire-starters and projectile points. The Indians at Milwaukee would cultivate not to exceed five or six acres to a family—mostly sweet corn, pumpkins, beans, melons and a few potatoes. They would have to fence in their fields against their horses….They would fence rudely, with bushes, poles and brush—sometimes poles fastened to bushes. They used no plows; they would only hoe the ground. Worked intensively over many generations, native garden plots became conspicuous landscape features. Milwaukee’s largest agricultural site sprawled across the present intersection of Lincoln Avenue and S. Layton Boulevard (Twenty-seventh Street) on the city’s South Side. Called Indian Fields by early white settlers, it covered well over 100 acres—a significant holding even by modern standards. Corn was the dominant crop at Indian Fields, and the chief of the adjoining village was named Oseebwaisum, or Cornstalk. 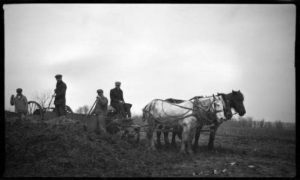 We speak of the day when practically all farm work was hand work, when cultivating was with the hoe, mowing with the scythe, reaping with the sickle or the cradle, binding and husking with the fingers, pitching with the two-tined fork. No relief could the harassed farmer find from the compulsory program of toiling “the livelong day” in order to eke out a livelihood for the family. Working with their backs and hands, Milwaukee’s immigrant laborers created an urban infrastructure that supported a comprehensive range of other occupations. 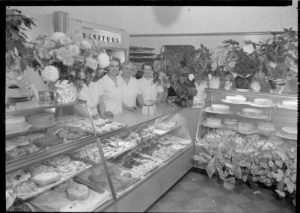 Merchants sold groceries, dry goods, and hardware. Craftsmen made shoes, barrels, and harnesses. Professionals treated fevers and filed lawsuits. Tanners, millers, butchers, and brewers plied their various trades. Whether they spent their workdays tending stores, hammering nails, figuring sums, cutting leather, or writing sermons, Milwaukee’s workers existed in a fluid symbiosis, each in some way making it possible for the others to earn a livelihood. During the last ten or twelve years of his life the casual observer might readily have set him down as a gentleman of leisure. At a reasonably early hour in the morning he would put in an appearance at the bank, examine his mail, and give brief attention to any matter that required it. In a little while he would take a stroll through the railroad offices, and then perhaps step in to have a little chat with the officers of the Insurance Company, all in a leisurely, unconcerned sort of a way, as if he had no business in particular to look after and was making a friendly call. Yet you may be sure he had a perfect understanding of what was going on in all those institutions, and was fully competent to advise or direct when occasion arose. The rise of a capitalist elite was accompanied by a shift in the popular understanding of what constituted work. Alexander Mitchell and his fellow business titans came to associate it with manual labor, a field of activity worlds removed from their deal-making and financiering. Eber Brock Ward, a Detroit entrepreneur who (with Mitchell’s help) established an iron mill on Milwaukee’s south lakefront in 1868, made the point clearly in a letter read to his assembled employees at an 1872 banquet: “I have never lost my interest in the welfare of the hard workers of the country, since I once earned my own living, fishing and rowing.” Ward’s suggestion that he had ceased to be a worker when money became his primary tool revealed a growing separation between capital and labor. It was not only the understanding of work that changed but the nature of work itself. As Milwaukee’s first heavy industry, Eber Ward’s own enterprise marked a sea change in the local economy. His Milwaukee Iron Company covered more than eighty acres at what is now the south end of the Daniel Hoan Bridge. In its shadow developed a company town called Bay View, which had a brief career as an independent suburb before joining the City of Milwaukee in 1887. The rolling mill became the second-largest producer of railroad rails in America, employing up to 1,500 men during periods of peak production. Those workers had specific tasks—puddler, heater, pickler, annealer, and many others, including laborer—but none filled more than a small niche in a plant whose furnaces, rolling stands, and pouring equipment were built on the massive scale. Gone were the cottage industries and home crafts of the pioneer period. Dwarfed by their surroundings, mill hands took a giant step away from hand work to a new order based on machine work. None but the men who have worked in these great hives of human industry, among immense furnaces and molten and seething metal, have any conception of the heat which a mill-hand has to endure while at his hard and tedious labor. Every time a machine was installed to do what machines had never done before, the cabinet makers and carvers came, singly or in twos, to see the work it did, untiringly, as fast as the hand fed it—“oh, so much faster than at the bench.” They took a piece to see better and feel of it—“how smooth, through knots and everything.” The machine-hand grinned, proud of his work, with eyes sparkling. With the victory of the machine he was coming up. Quietly, the others slunk back to their benches. They were licked. In growing numbers, Milwaukee’s workmen begged to differ. Fed up with what they perceived as inadequate wages and hazardous working conditions, a majority of Milwaukee’s industrial workers went on strike during the first week of May 1886. Marching behind the banner of the Knights of Labor, a national union with a formidable local presence, they campaigned for an eight-hour day without a cut in pay. Striking workers virtually shut down the city, prompting Gov. Jeremiah Rusk to call out the militia. By the morning of May 5, only one major employer remained open: the Bay View iron mill. When a crowd of 1,500 strikers, most of them Polish immigrants, marched on the mill that morning, they found the militia waiting for them. At a distance of roughly 200 yards, the troops opened fire, killing an estimated seven marchers. It was the bloodiest labor disturbance in Wisconsin’s history. The 1886 shootings quelled the immediate uprising, but they had the unintended effect of galvanizing industrial workers to organize politically. A People’s Party rose from the ashes of the eight-hour movement and virtually swept the fall elections of 1886; a millwright named Henry Smith went to Washington as the people’s representative in Congress. Although a fusion ticket of Republicans and Democrats retired the populists in the next cycle, a giant had been awakened. The events of 1886 proved to be a watershed in the city’s history, paving the way for the Socialist sweep of 1910 and fueling a continued campaign for workers’ rights. 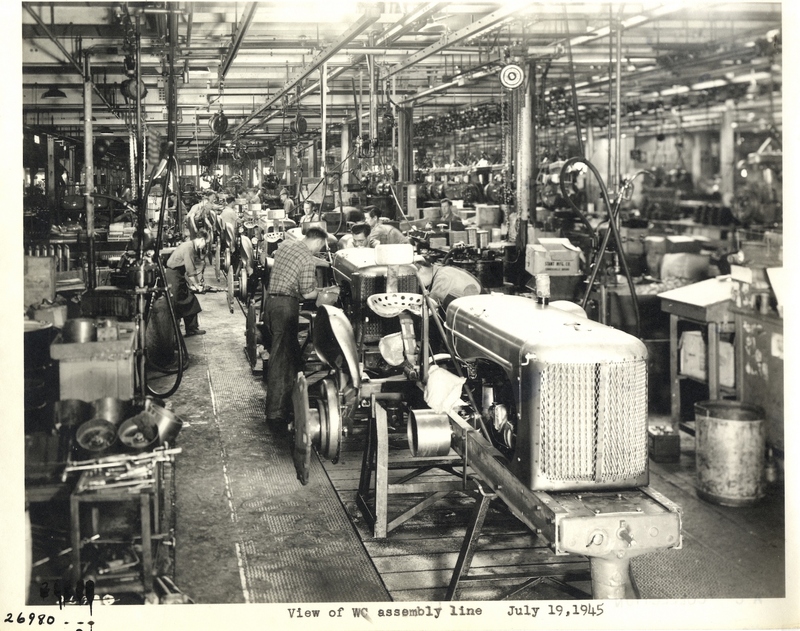 One corollary of Milwaukee’s status as a “monster workshop” was, beginning in the 1930s, unionization on the large scale. The Wagner Act and other New Deal measures adopted to halt the nation’s economic collapse helped make Milwaukee a particular stronghold of organized labor. 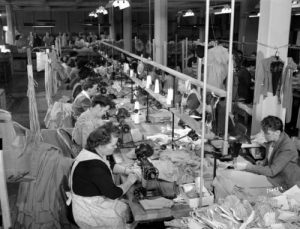 The complementary combination of a worker-oriented government and union-oriented workplaces endured through the privations of the late 1930s, the pressures of the 1940s, and the runaway prosperity of the postwar decades. Despite periodic downturns in the business cycle, it was not until the recession of the early 1980s that Milwaukee began to shed its industrial character. The metropolitan area lost more than 25 percent of its manufacturing jobs between 1979 and 1983. Allis-Chalmers, the largest provider of those jobs in Wisconsin, went bankrupt in 1987, and some of its former erecting shops were converted to strip malls. As deindustrialization gathered steam, the nature of work in Milwaukee changed again. Heavy industry did not wither away—local firms still supplied the world with everything from motorcycles to mining equipment—but manufacturing plummeted from 39 percent of metro-area employment in 1967 to less than 15 percent in 2014. Even at that reduced level, Milwaukee retained the second-largest concentration of manufacturing jobs in urban America; deindustrialization was clearly a national phenomenon. With factory work in shorter supply, service jobs moved into the lead, outpacing manufacturing for the first time in 1986. Aurora Health Care replaced Allis-Chalmers as the region’s largest private employer, and its executives moved into the former headquarters of the Heil Company, a manufacturer of truck bodies that had relocated to Tennessee. A high school diploma and a strong back were no longer enough to land a family-supporting job. Leading local employers—firms like Johnson Controls, Northwestern Mutual, Kohl’s, Metavante, and the Manpower Group—placed an increasing emphasis on knowledge, typically in the form of a post-secondary degree. Milwaukee’s work options, like America’s, gravitated to two extremes: well-paid knowledge positions and low-wage service jobs, with a widening gap between them. One industrial landmark embodies the current state of work in Milwaukee. A largely unionized work force, nearly 7,000 employees strong in the late 1960s, turned out switches, starters, relays, and timers at the Allen-Bradley plant on S. First Street for more than a half-century. The company became Rockwell Automation after a $1.65 billion buyout in 1985. Like so many other manufacturers, Rockwell moved production to lower-wage locales across the country and around the world. The last union worker left the South Side plant in 2010. The building remains busy as Rockwell’s headquarters, but nothing is made there anymore. Its thousands of employees spend their days designing, selling, supporting, computing, and managing—everything but manufacturing. The iconic Allen-Bradley clock, largest in the western hemisphere, looks out over a post-industrial landscape that the company’s founders and early workers would find astonishing. Where will work reside in the landscape of future Milwaukee? That remains a vexingly open question. ^ Frank Flower, History of Milwaukee, Wisconsin (Chicago: Western Historical Company, 1881), 422. ^ Helen Hornbeck Tanner, ed., Atlas of Great Lakes Indian History (Norman, OK: University of Oklahoma Press, 1987), 13-28. ^ “Antoine le Clair’s Statement,” Collections of the State Historical Society of Wisconsin, vol. 11 (Madison, WI: The Society, 1888), 240. ^ Charles E. Brown, “Archaeological History of Milwaukee County,” The Wisconsin Archeologist 15, no. 2 (July 1916): 24-25, 76-79, 80-81. ^ Joseph Schafer, Four Wisconsin Counties: Prairie and Forest (Madison, WI: State Historical Society of Wisconsin, 1927), 13. ^ Milwaukee Sentinel, December 9, 1894. ^ Schafer, Four Wisconsin Counties, 129. ^ Schafer, Four Wisconsin Counties, 119. ^ Quoted in John Gregory, History of Milwaukee, Wisconsin, vol. 1 (Chicago: S.J. Clarke Publishing Co., 1931), 86-88. ^ Kathleen Neils Conzen, Immigrant Milwaukee, 1836-1860 (Cambridge, MA: Harvard University Press, 1976), 69. ^ James S. Buck, Pioneer History of Milwaukee, vol. 1, rev. ed. (Milwaukee: Swain & Tate, 1890), 291. ^ Milwaukee Sentinel, January 5, 1872. ^ Bernhard C. Korn, The Story of Bay View (Milwaukee: Milwaukee County Historical Society, 1980), 55-56, 83, 114. ^ Milwaukee Sentinel, September 25, 1881. ^ Emil Seidel, “Sketches from My Life” unpublished memoir, (1938), Archives Department, University of Wisconsin-Milwaukee Libraries. ^ Henry Casson, “Uncle Jerry”: The Life of Jeremiah M. Rusk (Madison, WI: J.W. Hill, 1895), 208-209. ^ Korn, The Story of Bay View, 82-90; Thomas W. Gavett, Development of the Labor Movement in Milwaukee (Madison, WI: University of Wisconsin Press, 1965), 56-65. ^ Gavett, Development of the Labor Movement in Milwaukee, 68-75. ^ Bayrd Still, Milwaukee: The History of a City (Madison, WI: State Historical Society of Wisconsin, 1948), 476. ^ 1911 scrapbook, Otto Falk papers, Milwaukee County Historical Society. ^ Metro Milwaukee 1998 Economic Fact Book (Milwaukee: Metropolitan Milwaukee Association of Commerce, 1998), C-4. ^ Metro Milwaukee 1998 Economic Fact Book, C-6; Milwaukee Commerce [Metropolitan Milwaukee Association of Commerce] (Summer 2015): 6-9. ^ Metro Milwaukee 1998 Economic Fact Book, C-6. ^ Milwaukee Sentinel, June 24, 1993. ^ Milwaukee Journal Sentinel, August 1, 2010. Gurda, John. 1999. The Making of Milwaukee. Milwaukee: Milwaukee County Historical Society.